Bill Sampson: The theatah, the theatAh - what book of rules says the theater exists only within some ugly buildings crowded into one square mile of New York City? Or London, Paris, or Vienna? Listen, junior. And learn. Want to know what the theater is? A flea circus. Also opera. Also rodeos, carnivals, ballets, Indian tribal dances, Punch and Judy, a one-man band - all theater. Wherever there's magic and make-believe and an audience - there's theater. Donald Duck, Ibsen, and the Lone Ranger. Sarah Bernhardt and Poodles Hanneford, Lunt and Fontanne, Betty Grable, Rex the Wild Horse, Eleanora Duse - they're all theater. You don't understand them, you don't like them all - why should you? The theater's for everybody - you included, but not exclusively - so don't approve or disapprove. It may not be your theater, but it's theater for somebody, somewhere...It's just that there's so much bourgeois in this ivory green room they call the theater. Sometimes it gets up around my chin. Fasten your seatbelts, it's going to be a bumpy night. Note: ranked #9 in the American Film Institute's list of the top 100 movie quotations in American cinema. Max Fabian: She loves me like a father. Also, she's loaded. 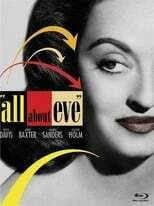 Old Actor: [about Eve] We know her humility, her devotion, her loyalty to her art, her love, her deep and abiding love for us, for what we are and what we do, the theater. She has had one wish, one prayer, one dream - to belong to us. Tonight, her dream has come true. And henceforth, we shall dream the same of her. Bill: ...you did it. With work and patience, you'll be a good actress if that's what you want to be. Eve: [purring] Is that what you want me to be? Bill: I'm talking about you and what you want. Bill: What have I got to do with it? Bill: Names I've been called, but never Svengali. Good luck. Eve: Don't run away, Bill. Bill: From what would I be running? Eve: You're always after truth on the stage. What about off? Eve: Then face it. I have. Ever since that first night here in this dressing room. Bill: When I told you what every young actress should know? Bill: Makeup's a little heavy. Bill: You're quite a girl. Bill: I'm in love with Margo. Hadn't you heard? Eve: You're all kinds of things. Bill: I'm only human, rumors to the contrary. And I'm as curious as the next man. Bill: The only thing - what I go after, I want to go after. I don't want it to come after me. Don't cry. Just score it as an incomplete forward pass. Bill: Many of your guests have been wondering when they may be permitted to view the body. Where has it been laid out? Margo: It hasn't been laid out. We haven't finished with the embalming. As a matter of fact, you're looking at it - the remains of Margo Channing, sitting up. It is my last wish to be buried sitting up. Bill: Wouldn't it be more natural for you to be taking a bow? Bill: The gong rang, the fight's over. Calm down. Margo: I will not calm down. Margo: You're being terribly tolerant, aren't you? Bill: I'm trying terribly hard. Margo: But you needn't be. I will not be tolerated and I will not be plotted against. Margo: Such nonsense. What do you all take me for - Little Nell from the country? Been my understudy for over a week without my knowing it, carefully hidden no doubt. Bill: I am sick and tired of these paranoiac outbursts...For the last time, I'll tell it to you. You've got to stop hurting yourself and me and the two of us by these paranoiac tantrums...You're a beautiful and an intelligent woman, and a great actress. A great actress at the peak of her career. You have every reason for happiness...but due to some strange, uncontrollable, unconscious drive, you permit the slightest action of...a kid like Eve to turn you into an hysterical, screaming harpy. Now, once and for all, stop it! Margo: I'll admit I may have seen better days, but I'm still not to be had for the price of a ****tail, like a salted peanut. Bill: The so-called art of acting is not one for which I have a particularly-high regard...But you may quote me as follows. Quote: 'Tonight, Miss Margo Channing gave a performance in your ****amamie play the like of which I have never seen before and expect rarely to see again.' Unquote....I shall propose the toast. Without wit. With all my heart. To Margo. To my bride-to-be. Bill: To be a good actor or actress or anything else in the theatre means wanting to be that more than anything else in the world. Eve: [softly] Yes, yes it does. Bill: It means concentration of desire or ambition, and sacrifice such as no other profession demands. And I'll agree that the man or woman who accepts those terms can't be ordinary, can't be just someone. To give so much for almost always so little. Eve: So little. So little, did you say? Why, if there's nothing else, there's applause. I've listened backstage to people applaud. It's like, like waves of love coming over the footlights and wrapping you up. Imagine. To know, every night, that different hundreds of people love you. They smile, and their eyes shine. You've pleased them. They want you. You belong. Just that alone is worth anything. Bill: We started talking. She wanted to know about Hollywood. She seemed so interested. Margo: She's a girl of so many interests. Bill: A pretty rare quality these days. Margo: A girl of so many rare qualities. Margo: So you've pointed out so often. So many qualities so often. Her loyalty, efficiency, devotion, warmth, and affection, and so young. So young and so fair. Bill: I can't believe you're making this up...Of course it's funny. This is all too laughable to be anything else. You know what I feel about this age obsession of yours. And now this ridiculous attempt to whip yourself up into a jealous froth because I spent ten minutes with a stage-struck kid. Bill: Thirty minutes, forty minutes, what of it? Margo: Stage-struck kid! She's a young lady of quality. And I'll have you know I'm fed up with both the young lady and her qualities. Studying me as if I were a play or a blueprint, how I walk, talk, think, act, sleep. Bill: Now, how can you take offense at a kid trying in every way to be as much like her ideal as possible? Margo: Stop calling her a kid. As it happens, there are particular aspects of my life to which I would like to maintain sole and exclusive rights and privileges. Bill: ...Mad! Darling, there are certain characteristics for which you are famous onstage and off. I love you for some of them in spite of others. I haven't let those become too important. They're part of your equipment for getting along in what is laughingly called our environment. You have to keep your teeth sharp, all right. But I will not have you sharpen them on me - or on Eve. Margo: What about her teeth? What about her fangs? Bill: She hasn't cut them yet, and you know it! So when you start judging an idealistic, dreamy-eyed kid by the barroom benzedrine standards of this megalomaniac society, I won't have it. Eve Harrington has never by a word, a look, or a suggestion indicated anything to me but her adoration for you and her happiness at our being in love. And to intimate anything else doesn't spell jealousy to me. It spells out paranoiac insecurity that you should be ashamed of. Margo: Cut! Brilliant! What happens in the next reel? Do I get dragged off screaming to the snake pit? Birdie: What a story! Everything but the bloodhounds snappin' at her rear end. Margo: There are some human experiences, Birdie, that do not take place in a vaudeville house - and that even a fifth-rate vaudevillian should understand and respect! De Witt: [about Eve] It wasn't a reading. It was a performance. Brilliant, vivid, something made of music and fire. De Witt: In time, she'll be what you are. Margo: A mass of music and fire. De Witt: And tomorrow morning, you will have won your beachhead on the shores of immortality. Eve: Stop rehearsing your column. Isn't it strange, Addison? I thought I'd be panic-stricken, want to run away or something. Instead, I can't wait for tonight to come, to come and go. De Witt: Are you that sure of tomorrow? Eve: It will be a night to remember. It will bring me everything I've ever wanted. The end of an old road. The beginning of a new one. De Witt: All paved with diamonds and gold? Eve: You know me better than that. De Witt: It's paved with what, then? Eve: Stars...Plenty of time for a nice long nap. We rehearsed most of last night. De Witt: You could sleep now, couldn't you? De Witt: The mark of a true killer. Sleep tight, rest easy, and come out fighting. Eve: Why did you call me a killer? De Witt: Oh, did I say killer? I meant champion. I get my boxing terms mixed. De Witt: But if I may make a suggestion...I think the time has come for you to shed some of your humility. It is just as false not to blow your horn at all as it is to blow it too loudly. Eve: I don't think I have anything to sound off about. De Witt: We all come into this world with our little egos, equipped with individual horns. Now if we don't blow them, who else will? Eve: Even so, one pretty good performance by an understudy - it'll be forgotten by tomorrow. De Witt: It needn't be.